I take great pleasure in introducing ground-breaking new evidence that proves everyone's health is being affected by "smart" meters. This evidence is a world first, and shifts the debate from whether anyone should have to pay a fee to refuse a "smart" meter to: When does the safety recall start? In EKG Proof That "Smart" Meters Affect the Human Heart you will see me connected to an EKG monitor while resting near an Elster brand "smart" meter of the type used by APS here in Arizona. 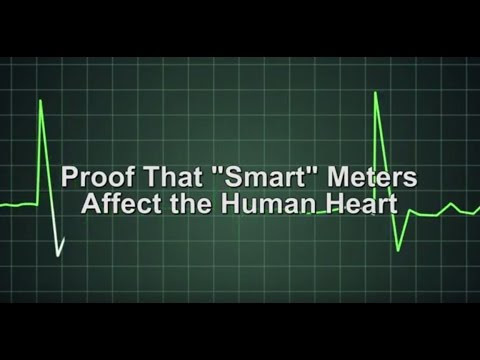 When the "smart" meter transmits, the EKG shows that my heart rhythm is interrupted. Looking at the results of the EKG is startling. We now know that even if people are not showing outward symptoms, their bodies are being unnecessarily and involuntarily stressed by "smart" meters. There must be a complete safety recall of all "smart" meters at once. This was a presentation given to Merton Council. Officials said smart meters are perfectly safe, as the level of radiation they emit is less than that of a mobile phone. Energy companies are planning to install the devices in British homes by 2019 to make gas and electricity readings more accurate. However, Stop Smart Meters UK told MPs that there is evidence the radiation could be 140 to 800 times higher than that from mobile phones. Dr Liz Evans, a campaigner, said there are hundreds of studies showing "evidence of harm could be acute", including possible "chronic effects from long term exposure such as cancer, infertility, dementia, genetic damage, immune system dysfunction and damage to fetuses". "We are many organisations calling for a precautionary approach, particularly for children," she said. A new report coming from Australia warns that industry has vastly underestimated the energy consumption resulting from more and more people accessing cloud services using portable devices. The popularity of these services is "driving a massive surge in energy consumption." Previous research has focused on the data centers that serve up the information. In reality, says the report, more than 90% of the energy consumption will come from the wireless networks that connect to the data centers. My questions: Is the discrepancy for real? If so, it is enough to distort our forecasts of future load growth? Melbourne's Centre for Energy Efficient Telecommunications (CEET) has for the first time calculated the energy consumption of the cloud computing "food chain." The report, "The Power of Wireless Cloud," warns that we have grossly underestimated the energy consumption of the cloud ecosystem. The energy use of cloud services is expect to grow as much as 460% between 2012 and 2015. Wireless access networks (WiFi and 4G LTE) will be responsible for 90% of that energy. Data centers will account for only 9%. The rule of law has completely gone out the window in the Chicago, Illinois, suburb of Naperville, where two mothers were recently arrested for trying to stop utility workers and local police from illegally trespassing on their private property in order to install cancer-causing "smart" meters. As voiced by anti-smart meter activists during a recent city council meeting following the arrests, the city of Naperville blatantly violated its own ordinances by not only having the women arrested, but also by trespassing on their private property without consent. The Government had promised that every household would have a smart meter by 2019 in a £12 billion programme to stop gas and electricity bills being estimated. Contract terms and different smart meter technology platforms are restricting competition as businesses face rising energy prices. Hidden charges for smart meters are catching small businesses unawares, says a price comparison company. The sophisticated meters are being offered free by energy suppliers as part of a national programme to provide new products and services and make it easier for businesses and householders to monitor consumption and improve efficiency. Installing smart meters may not result in households saving energy, a study has suggested. Smart meters had been considered as one component in an infrastructure to help use energy more effectively, and cut bills and emissions. Research by a University of Oxford scientist found that the devices alone were unlikely to lead to an overall reduction in the demand for energy. Green plans to make struggling families pay £11.3billion to install smart energy meters in every home risk being an expensive flop and even causing family rows. Energy Secretary Chris Huhne claims the new meters will allow people to see how much energy they are using by the minute, so encouraging them to cut back. However, a 12-month pilot study involving thousands of British families found they ‘may have not much effect’ on consumption, and can even trigger arguments. Global Research, August 19, 2011. The Green Party of B.C. is calling for a halt to smart meter installation across the province over health and environmental concerns. Party Leader Jane Sterk said the meters that record energy use in homes and businesses would expose people to electromagnetic radiation, much like microwaves. She said the World Health Organization has cited electromagnetic radiation as a possible carcinogen. "So the Green Party is calling on BC Hydro to halt the installation of smart meters, to put in place a long-term energy plan," Sterk said during a news conference Wednesday. Sterk appeared with Dr. Magda Havas of Trent University in Ontario, who has written about the possible impact of cell phones or microwaves on fertility rates. Over 300 people attended this hugely successful event, which has sparked a burgeoning movement against ‘smart’ meters in Southern California. Stop Smart Meters! caught up on Wednesday evening with Daniel Hirsch, a lecturer and expert in nuclear policy at UCSC who has been widely quoted in the media regarding recent events in Japan. Mr. Hirsch had just finished his talk at Stevenson College, UCSC about the crisis at Fukushima and what it means for the future of nuclear energy. Mr. Hirsch reviewed the report on smart meters and health requested by the state legislature and found some very disturbing anomalies. It appears that many of the distortions that industry has used to deflect concern about such non-ionizing wireless radiation are the same techniques that have been used for many years to downplay ionizing nuclear radiation. From Mr. Hirsch's calculations, smart meters expose residents to about 100x the microwave radiation of a cell phone- precisely opposite what the industry is claiming. A burst of opposition to smart meters in a Northern California county appears to have turned heads in the state commission with jurisdiction over the emerging technology, with at least two prominent officials yesterday signaling they would consider letting consumers opt out. Citing alleged health effects from electromagnetic waves, a county in the North San Francisco Bay Area has criminalized the installation of "smart" electric meters. The Marin County Board of Supervisors unanimously passed an ordinance (pdf) yesterday that deems the installation of smart meters a public nuisance in some areas. The law applies to unincorporated Marin, home to about 70,000 of the county's 260,000 residents. In addition to electromagnetic health risks, the board cited concerns about meters being used to collect information about residents' activities, impacts on aesthetics and potential damage to amateur radio networks. Is wireless technology making us sick?